If Lee Harvey Oswald did it, he could not have done it alone. If he did not, he must be the hit of the century. If he was involved and somehow double-crossed, alive today must be persons with the guilt of awful silence. "Dallas, Texas. 12.30pm. Friday, 22 November 1963. President John F. Kennedy is assassinated. Approximately 70 minutes later, assassin Lee Harvey Oswald was arrested. 48 hours later, Lee Harvey Oswald himself was murdered. 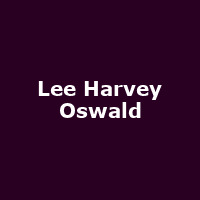 Told through the eyes of Oswald's wife and mother, coupled with extracts from the Warren Commission's report, we follow the unsettled drifting life of Lee Harvey Oswald - his loveless marriage to his Russian wife, his challenging relationship with his mother and his pathological hatred of Kennedy's life and achievements. Oswald had the means, motive and opportunity, but did he even do it? Could a man who never did anything on his own murder a President?"